Our advanced Matrimony Android App is designed mainly for the users to find their perfect groom/bride by matching the perfect partner. This Matrimony App is one of the emerging and revenue generating app for the new entrepreneurs to start their own million dollar business without any complexity. The app is analyzed and designed by our Android experts were they integrated the major advanced functionality of all the matrimonial application. This app is now high on demand among the business entrepreneurs because of its simplicity in handling, flexibility, and revenue generating app and mobile-friendly customization. The Matrimonial Mobile App for Android has unique user attractive mobile customization templates and features, nowadays the finding of the perfect soul partner is much more difficult from the 7.7 billion people around the world, and so we developed the user recommend the matrimonial app. The users can register their account with their valid mail id and password, name, phone number, marital status, religion, caste and date of birth etc. After the successful registration, the user can log in to the account whenever they like from their Android mobile. The user can see the list of profiles where the user can able to find their matching partner with the simple click and by seeing the bio-grapy and details about the user. This Matrimony Mobile Application has specialized feature that the user can able to send the request to the matching profile by using our advanced searching feature where the user can submit their wish by entering the age, religion, caste, country and marital status etc, where the user can get responsive and accurate result based on the user query. It is easy for the users to navigate the menus with easy accessibility. The user can send the matching request to the matching user where the respective user can accept the user request by viewing the user profile and the details. The details contain all the essentials credentials about the user like designation, hobby, physical appearance, family details, education, and career etc. In this Matrimony Android App, has the admin portal where the overall application management is managed by the admin, the admin can have easy managing tools and functions to make the app more realistic user-friendly matrimonial application. The admin can also get the profit by using the revenue models in the app. The user membership plans are managed and maintained by the admin, the alert notifications of the membership plans are sent through the respective users to upgrade the account plans. The admin can add or remove the user profile by simple accessibility, so it is easy for the admin to manage the matrimony app. The benefit and profit of using the Matrimonial Mobile App for Android are high among the business entrepreneurs because the app is designed and customized based on the business understandings, in addition to the user benefit we provide 1-year free technical support, 6-months software free update, and mobile-friendly app. Suggestion profile, Matches, Advanced Search option, Send and Receive interest, Membership Plan, Profile management, Detail profile page. php scripts mall is the best solution for providing mobile app script for matchmaking. They gave you with clear documention. Those who are entrepreneur to start their business this is the right place,, I recommend for future products ………….!!!!!!!!! 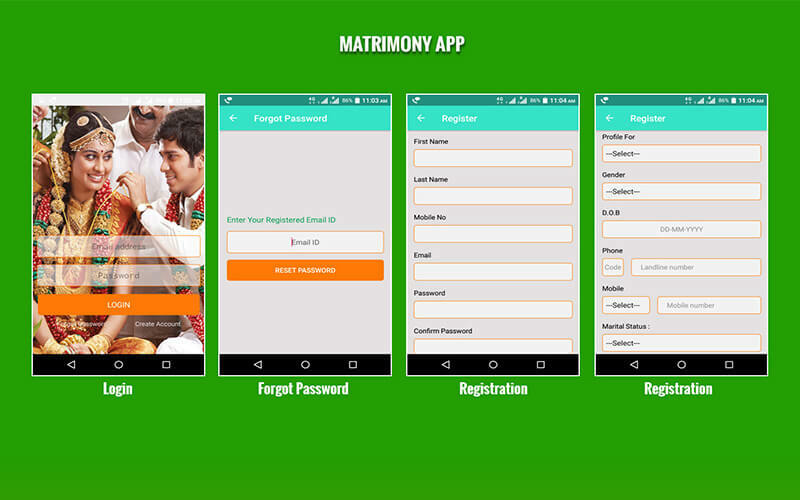 Matrimony Android App is just awesome interface to used by my customers. Through this can find best match making because it contains user friendly accessibility. I am well satisfied by using this app. It’s just rocking for the making of the match. Thumbs up for the team to this App development.